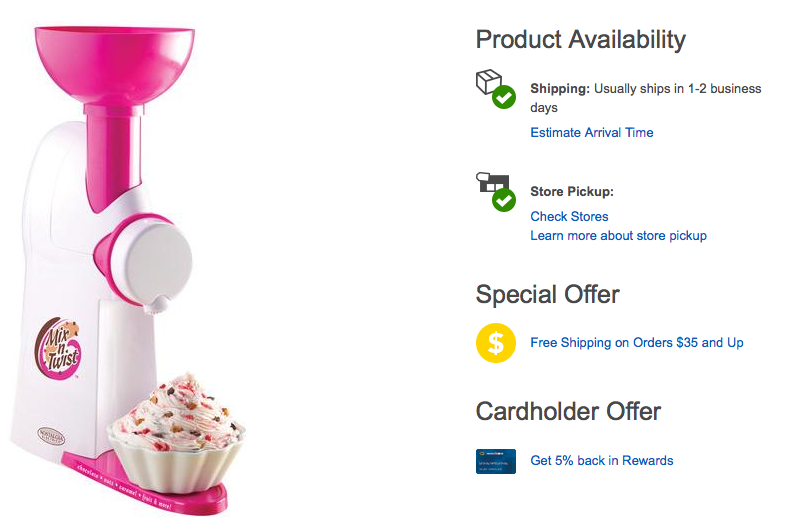 Nostalgia Electrics Mix 'n Twist Ice Cream & Toppings Mixer Only $14.99 + FREE Store Pick Up (Reg. $34.99)! You are here: Home / Great Deals / Nostalgia Electrics Mix ‘n Twist Ice Cream & Toppings Mixer Only $14.99 + FREE Store Pick Up (Reg. $34.99)! Nostalgia Electrics Mix ‘n Twist Ice Cream & Toppings Mixer Only $14.99 + FREE Store Pick Up (Reg. $34.99)! How FUN would this be to have around for the kiddies or grandchildren! Right now, you can get this Nostalgia Electrics Mix ‘n Twist Ice Cream & Toppings Mixer for only $14.99 + FREE Store Pick Up (Reg. $34.99) if available in your area! This ice cream mixer that features 120W of power to blend your favorite toppings with ice cream, frozen yogurt, sherbet and more for a sweet, mouth-watering dessert.